That idea is taken specifically from John’s account of the events we just heard read from Luke 19. This is one those key events that is marked out by all 4 Gospel writers –each giving their particular notices of the facts, & each varying in which facts they emphasize in their individual accounts. You get those events in their proper sequence by merging John 12; Matt. 21; Mark 11 and Luke 19. As you can tell from the text read – today’s focus on Luke’s account. This last week of Jesus’ life was not a slow, leisurely walk to Calvary. Jesus was not stepping back from His ministry in any way – even though He knew the end was at hand. If anything, he was busier than ever. He was spending His nights in Bethany – where Mary, Martha and Lazarus were, and then walking 2 miles or so into Jerusalem each day – teaching as He came & went, as well as in the Temple. The evening before this Mary anointed Him with perfume and without knowing it, prepared Him for His burial. During the week He performed a number of signs: cursing the fig tree and cleansing the Temple – entering into several confrontations with the Priests & Jewish Elders, giving His longest discourse on what the future would hold, washing the Disciple’s feet, instituting the Lord’s Supper at His last supper, inaugurating the New Covenant & praying in the Garden of Gethsemane – all during these few days. But it is on Sunday – the beginning of this last week that what we’re looking at today took place. As Jesus left the little village of Bethany that day, he was thronged by crowds that had heard He was back in Bethany at Lazarus’ house. After raising Lazarus from the dead, Jesus had retreated to a little town called Ephraim – about 12 miles away – until the feast of Passover drew near. Exactly how long we don’t know. A few days? A month or better? But not very long. We know it was soon after because the buzz about Lazarus is still hot. This crowd is then multiplied by many in Jerusalem who heard He was near – and who went out to see Him as well. Josephus, the Jewish historian and Jesus’ contemporary tells us @ the Passover, Jerusalem’s population could swell to about 3 million. It is this mixed group that then acts in a very startling way. Having already sent some disciples on ahead into Jerusalem, Jesus sits upon the young donkey they bring – and proceeds to ride into the City while all of this cheering and shouting is going on. The crowd, either adorning the trees and bushes with their clothes to make it somewhat like a royal procession – or actually throwing them on the ground for Jesus to ride over – signifying their subjection to Him as their coming King – raise a huge ruckus. He comes to the city, looks out over it and – He weeps. He prophesies Jerusalem’s destruction. Something He’ll unpack in ghastly detail later in the week as recorded in Matt. 24. They didn’t understand “the things that make for peace” in at least 3 ways. It appears from their actions, the Jews thought if they could just get a powerful political leader – they could throw off the yoke of Roman oppression and have PEACE in their nation. They thought lack of peace was the problem rather than the symptom. And, they thought the remedy was to fix the circumstances, not their hearts. That the problem was political or societal – rather than spiritual. But here they were – living under brutal Roman occupation. In their case, they needed to seek the face of God in repentance for their sin of making God’s laws and commands into an end in themselves. i.e. They had twisted God’s Law so that in their eyes, loving and serving God was just a matter of obeying rites and ceremonies – instead of recognizing those things as the testimonies of the coming Messiah’s person and work. It was because they had made an idol out of Judaism – they were in this horrible state. Any time someone makes service to God MERELY a matter of carrying out certain obediences – however noble and right and good they may be – instead of having hearts humbled before Him, grieving over sin and looking to the substitutionary death of Jesus for our sins – the result is: [IDOLATRY]. IN this way WE can make Christianity as idolatrous as they made their Judaism. We too become idolaters when we think as long as we are doing the right religious “stuff” – we do not need to care about our hearts, and our secret sins and our sinful attitudes and actions. When we imagine we can just confess them, do our religious duty and go on our merry way. Jesus weeps because they do not know their true need is not deliverance from the Romans – political and social peace – an external problem of circumstances – but a SPIRITUAL problem, a problem with the state of their souls. Their need was peace with God – NOT peace with the Romans. Spiritual unrest can only be resolved in reunion with God in Christ. We can see their error both in their actions and in Jesus’ response. NOTE: Jesus riding a young donkey. This is the only record of Jesus ever riding. He always walked. Dignitaries rode, Kings, Judges, Military officers, Governors. But His using a young donkey also has direct bearing on what the crowd is doing. They are making overtures to make Him King! They are seeing Him – ostensibly because of the miracles He had done – as their long awaited Messiah – in the sense that He would sit on the throne of David – and break the yoke of Roman oppression. It is especially clear from Matt., Mark & John that Jesus is doing this so as to self-consciously fulfill the prophecy of Zechariah 9:9. NOTE: Waving palm branches. This was not a mere spillover from the Feast of Tabernacles 6 months earlier, where God had commanded the Jews to wave the branches of luxuriant trees – like the palm – and dwell in booths for 7 days to commemorate God’s blessings – and especially His blessings while they journeyed in the desert after leaving Egypt. We know from external sources that by Jesus’ day, indeed from about 200 hundred years earlier when Simon the Maccabee won a decisive victory over the Syrians and ran them out of Jerusalem – celebrating such military and political victories with waving palms had become a symbol of Jewish nationalism. Jesus must confront this gross misunderstanding of His person and work – and we see how deeply this affects Him. He weeps. For only the 2nd recorded time. He weeps. They did not know they were in fact at war with God Himself – as the Roman occupation testified to. What would make for Israel’s peace was to stop chaffing at the Romans, and start seeking the face of God, and the forgiveness and righteousness which is found only in Christ Jesus. This is what everyone outside of Christ needs to realize. Our biggest problems aren’t economic, societal, or even moral in the sense of just acting in moral ways – each person outside of Christ is at war with God. Struggling with Him over who has the right of supremacy over their lives – spirit, soul, body, relationships, money – you name it. And this can even still spill over into the Christian’s life as well can’t it? You lack peace in your family, peace with your parents or your spouse? The answer isn’t to get out of the house, or get rid of the kids or try a different spouse – it is to seek your fulfillment in Jesus Christ, so that you stop demanding it of others. You cannot live at peace with others when you believe they are robbing you, shortchanging you or denying you what you have a right to. And you certainly cannot live at peace with God if you suspect or blame Him for the same things. Until you find your satisfaction in Him – there will be no peace inwardly, and thus no peace outwardly. They would murder Him, not because they knew Him as God’s lamb, appointed to take away the sins of the world – but because He wasn’t what they wanted Him to be. What would it take to bring this peace with God? Nothing less than His joyful, willing submission to the plan of Father. And this too proves to be a place where often even Believers fail to find peace. As long as we chafe at God’s providences in our lives – unwilling to submit to the plans and purposes He has laid out for us – in which battles we must fight, in what circumstances we must endure, in the work we must do – until we stop gritting our teeth at Him secretly over what we face and see it as from His loving hand instead – we cannot have peace even IN our salvation. It does not mean we do not strive to fix adverse circumstances when we can legitimately do so – but it DOES mean we accept the reality the circumstances face are LOVINGLY arranged for us in our lives. That the particular struggles we have are gifts given for our ultimate spiritual good. He plans to meet us in them and use them to work Christ’s image in us through them. Merely changing circumstances will do nothing. Christ’s sacrifice alone makes peace with God for the sinner. And submission alone to the loving hand of God in Providence makes for peace in the Christian’s heart and mind. Something He’ll unpack in ghastly detail later in the week as in Matt. 24. He weeps because He foresees their rejection of Him in His saving capacity. Because He did not do what THEY thought they needed done – and that this rejection will result in the gruesome and unspeakably brutal destruction of Jerusalem. There is nothing left other than to endure the wrath of God in horrific judgment. When Titus stormed Jerusalem in 70 AD fulfilling this prophecy, Josephus, the Jewish historian witnessing it said that 1.1 million people were slaughtered in the siege. Nearly 100,000 more we dragged off into slavery. And this – but a type and shadow of the final destruction when God’s wrath is poured out on all who refused Him in the preaching of the Gospel at the end of the age. He wept because they had NO idea what real peace meant, nor that it would take the blood of the Spotless Lamb of God to procure it. And because of the just wrath which must ensue rejecting Him. 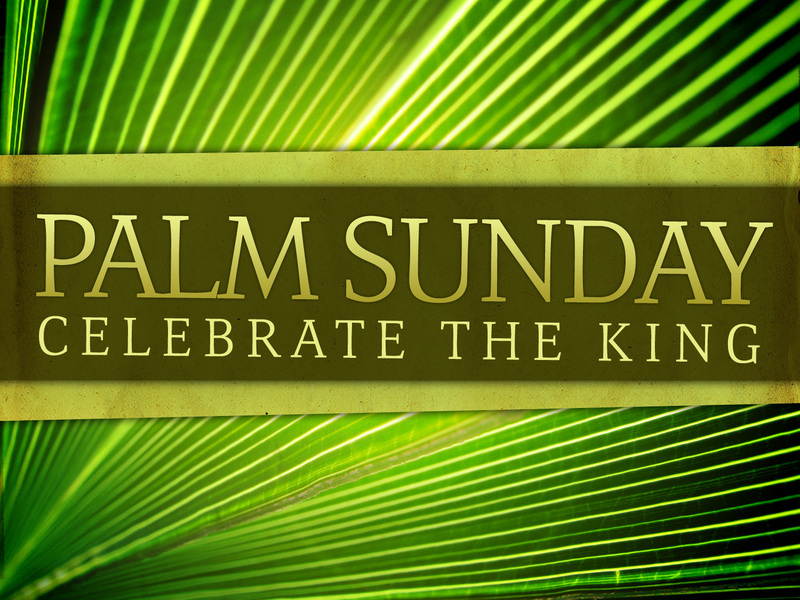 Believer – This Palm Sunday – re-immerse yourself in the Gospel. Marvel again that you have peace with God because of Christ – that in His blood every sin has been fully paid and its stain wiped away. And joyfully yield to His providences in your life. Life at peace. Unbeliever – This is what makes for peace between you and your God – nothing less than the substitutionary death of Jesus Christ at Calvary – enduring the wrath of God that you might go free. Lay down your weapons of rebellion and independence at His feet. Flee the judgment to come – by fleeing to the foot of the Cross. CLICK HERE to PLAY GLAD’S “BE YE GLAD” VIDEO. D. A. Carson, The Gospel according to John (The Pillar New Testament Commentary; Leicester, England; Grand Rapids, MI: Inter-Varsity Press; W.B. Eerdmans, 1991), 433. I have been blessed by your faithful, thoughtful handling and presentation of the Word of God. We are new to Fairport, have attended services a few times, but have circumstantially been unable to attend regularly. However we have availed ourselves of your online presence and have been continually blessed, strengthened and edified. Praying for your health and God’s blessing on your ministry and in your life. Margaret, thank you so much for your kind and encouraging letter. It is greatly appreciated. And I am so sorry you’ve been unable to attend ECF lately. Please do not hesitate to contact us if we can be of any assistance you and your husband.